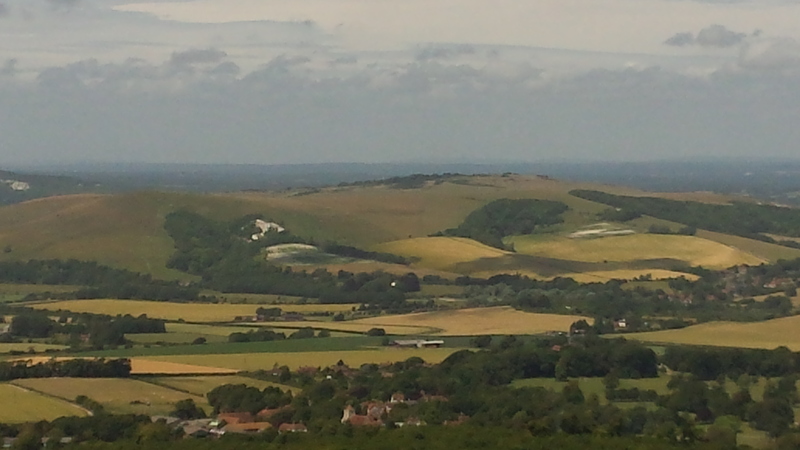 As a reward for completing the decorating Mrs CFS suggested I might like a day out walking. Now one doesn’t look a gift horse in the mouth does one! The only question was were should I go. Because the hills in this area are so small it is not worth travelling any distance to do just one hill, I have several hills to the east that are yet to be done but I already have opportunities to do those later in the year. 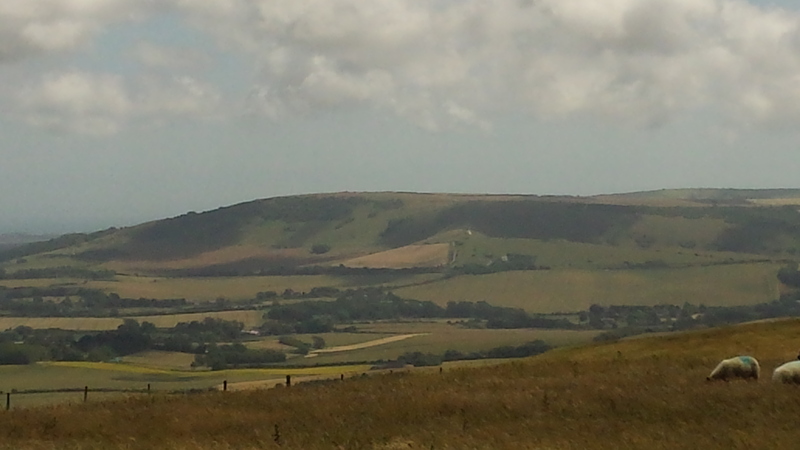 So that left Nine Barrow Down/Swyre Head or Win Green/Long Knoll. I recalled a few weeks ago the English AM, Jimmy, announcing that Swyre Head will be delisted on the 1 Mar 16 due to reassessed height information. 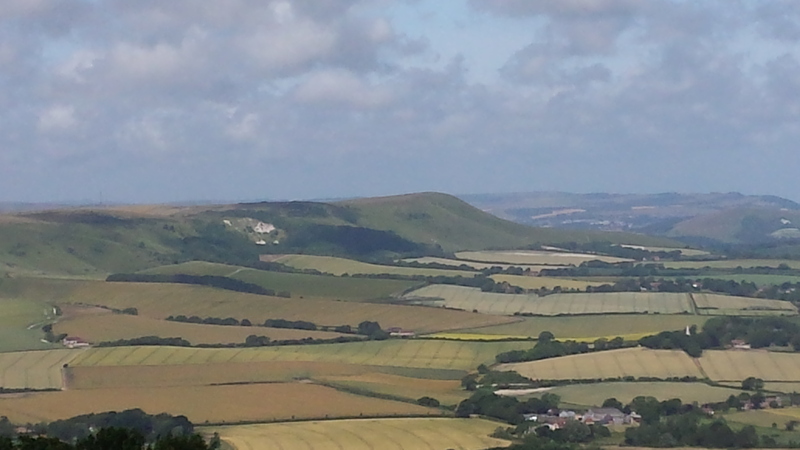 It was therefore decided to go to the Isle of Purbeck and do the two hills either side of Corfe Castle. 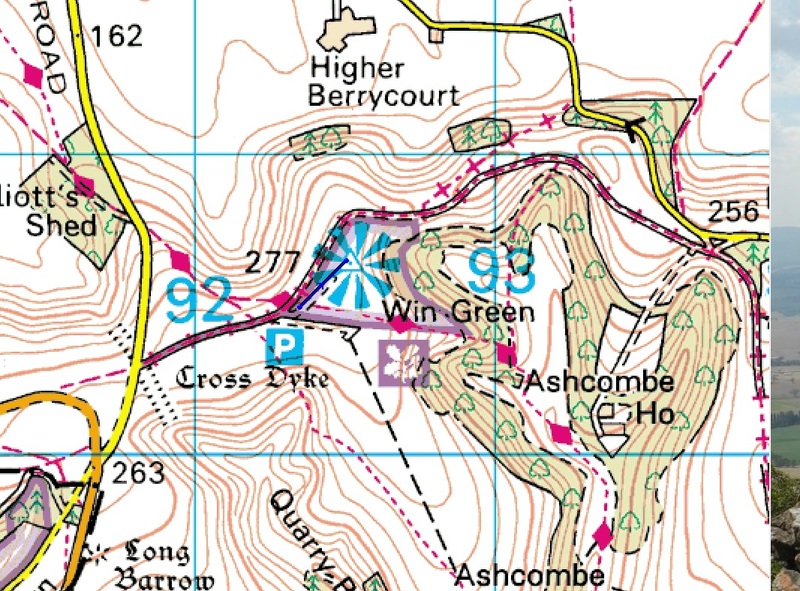 I left home at 0800 and headed off down the M27/A27 for Corfe Castle arriving at the parking place (SZ 00793 81845) at about 0945. There is a small parking area on the north side of the road with enough room for 1 car, if this is occupied there is a viewing point parking area about 200 metres to the west. Do not park in the area immediately by the start of the footpath as this is used regularly by the farmer for access to his fields. 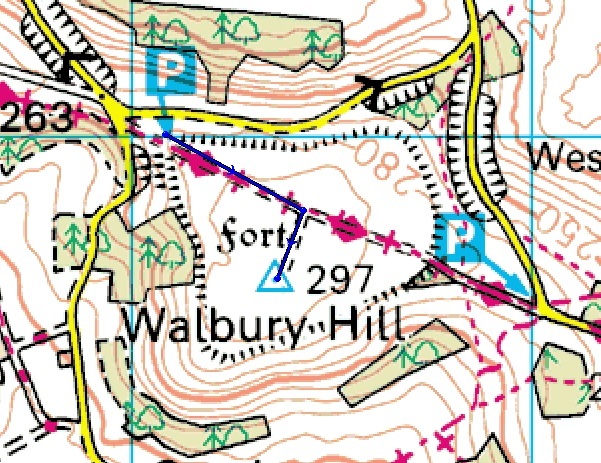 The walk up to the top of the ridge is a pleasant gentle stroll on a well formed footpath heading up through Kings Wood (NT property) covering 1.12 miles and 282 ft of ascent. Time taken to summit 25 minutes. The Activation Zone is large so there is no problem choosing a suitable to fence to support the aerial mast. FT-817 5W, 2Ah SLAB, linked dipole 60m, 40m & 20m and palm paddle keyer. Once set up I put out a self spot for 7.130 MHz but I realised how bad the bands were, with absolutely no responses to my calls on 40m SSB. 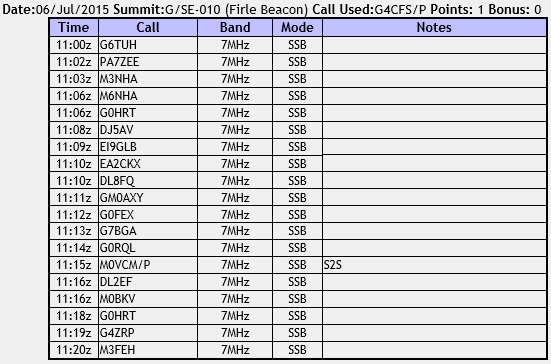 So a quick change to CW and a spot via KU6J brought in 10 QSO’s mostly with DL including what I thought was a S2S with DL6WT/P but the summit I copied RP-169 has been de-listed! 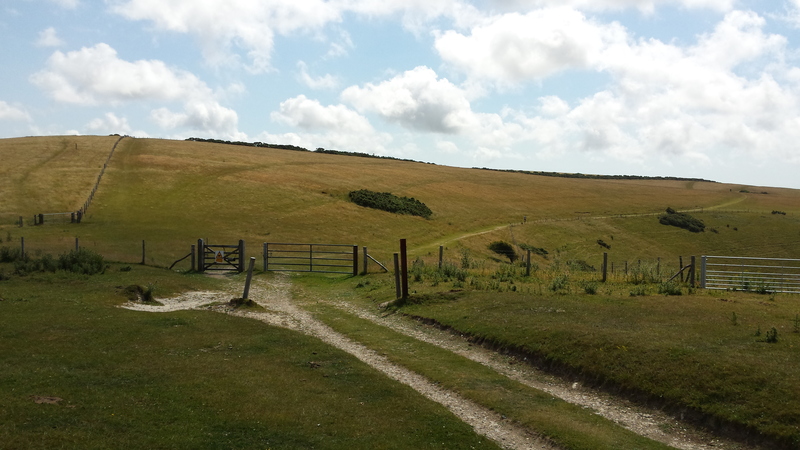 I was very reluctant to leave Nine Barrow Down because the views were amazing all along the south coast to Portland and north to Shaftesbury. 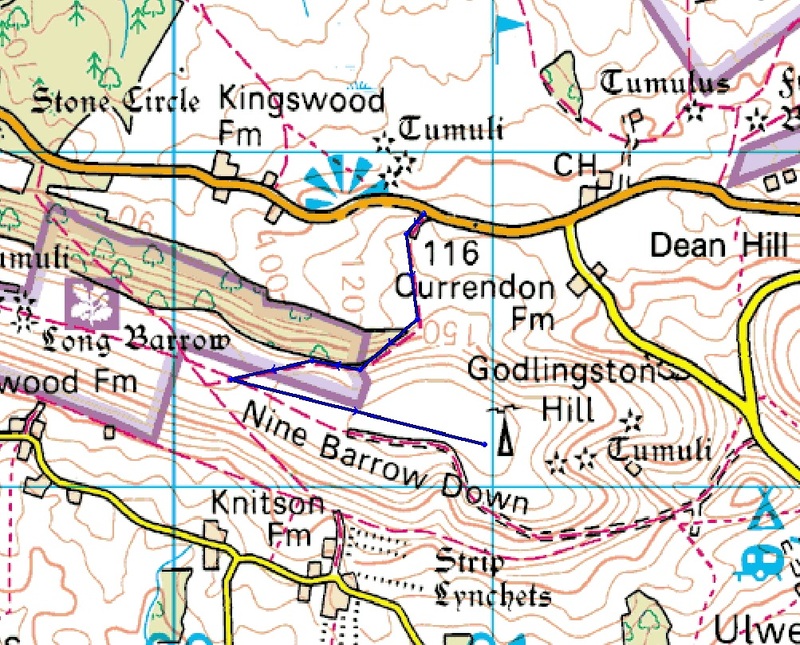 But there was another hill to walk so it was back to the car and set off through Corfe Castle and Kingston to my next starting point. 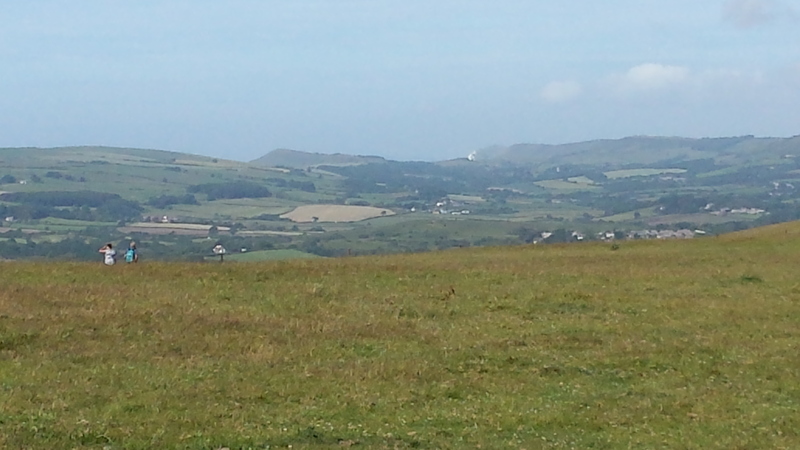 The car park for Swyre Head (SY 94332 79260) was only a 15 minute drive away through the beautifully picturesque village of Corfe Castle. 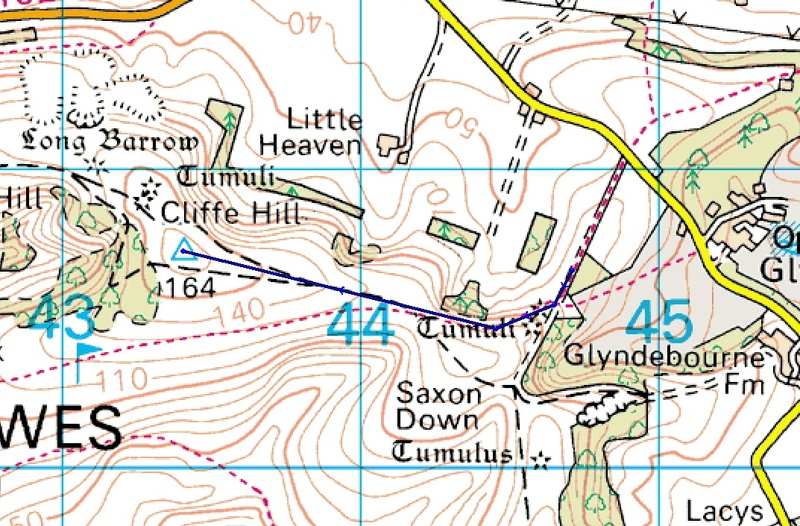 The access to Swyre Head is via a Bridal Way through the Encombe House Estate and strict adherence to the path is requested. 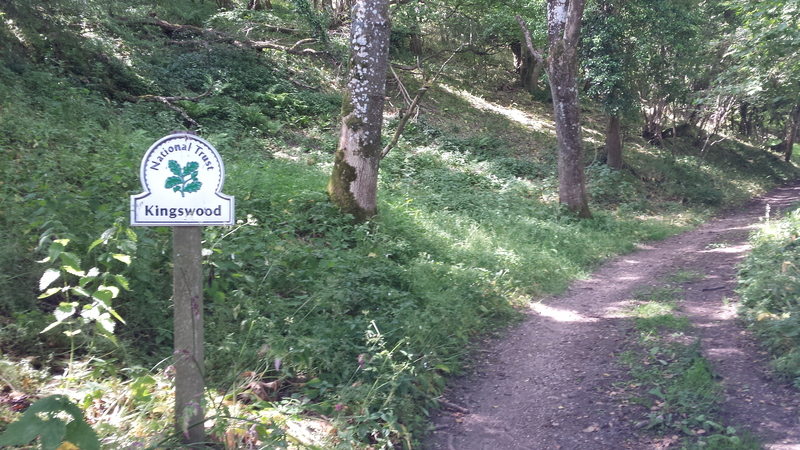 The walk up is gentle and easy going and the view down to the coast are wonderful. 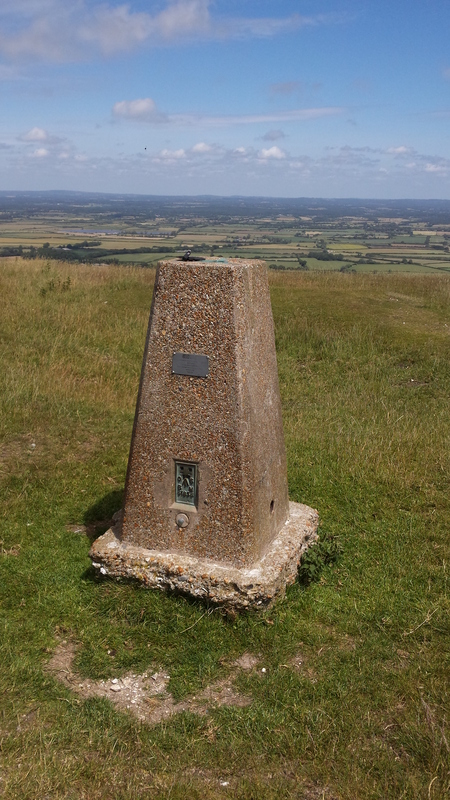 The high point of the summit is on top of the tumulus and the trig point is some 50 metres away. 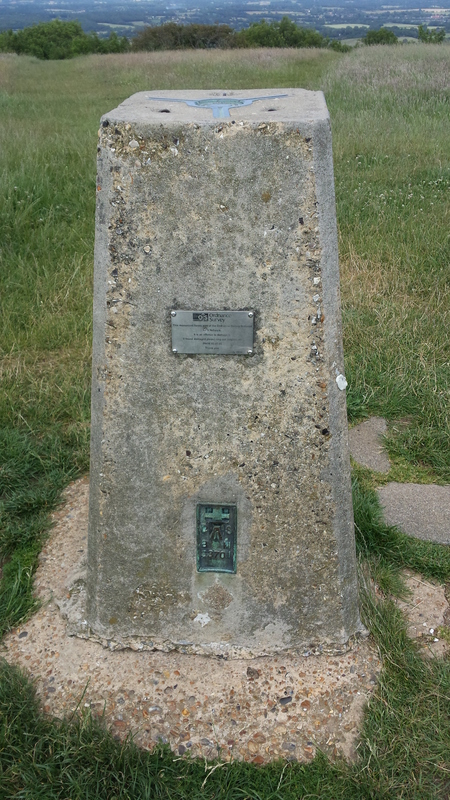 Distance walked 0.83 miles total ascent 228 ft time taken 20 minutes. Unlike this morning when 40M SSB was non-existent, this afternoon was a different picture altogether. Checking Sotawatch resulted on S2S contacts with Steve DL/G1INK/P on DM/TH-470, Barry, M0IML/P on G/SE-015 and Ricky MW6GWR/P on MW001. A self spot on 7.130 MHz resulted in a further 9 QSO’s before a quick check was made on CW to no avail. The complete opposite of the earlier activation. By the time I go back to the car it was only 1PM so there was time for a third summit. 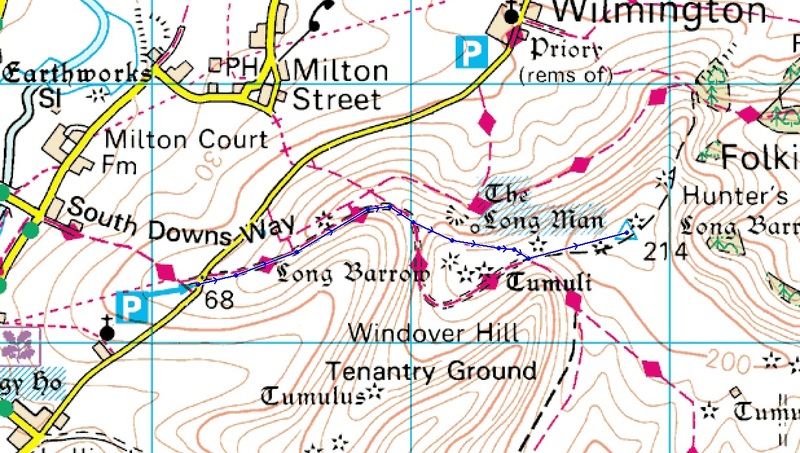 A quick check of the SOTA POI files on my Tom Tom showed that Win Green G/SC-008 was the next closest hill and it was in the right direction for heading home afterwards. The drive took just over the hour before arriving in the spacious car park (ST 92347 20485) within 200 metres of the summit. 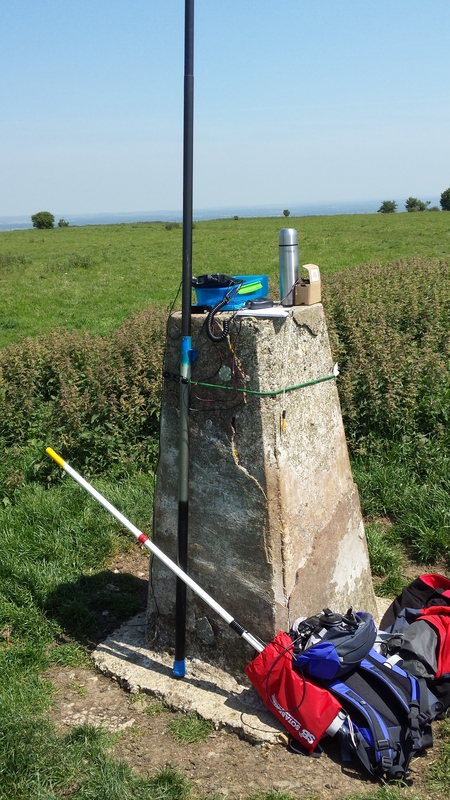 Having walked up to the observation point and the trig point and taking a gentle stroll around the small wooded area I moved to the SE of the summit enclosure to the fence to set-up the station. Just like first thing this morning 40m SSB was dead but managed 7 QSO’s on CW again mainly with EU stns plus Victor in GI. The pace of the whole day had been one of slow gentle serenity, the weather had been fantastic with clear skies and temperatures in the mid/high 20C’s. 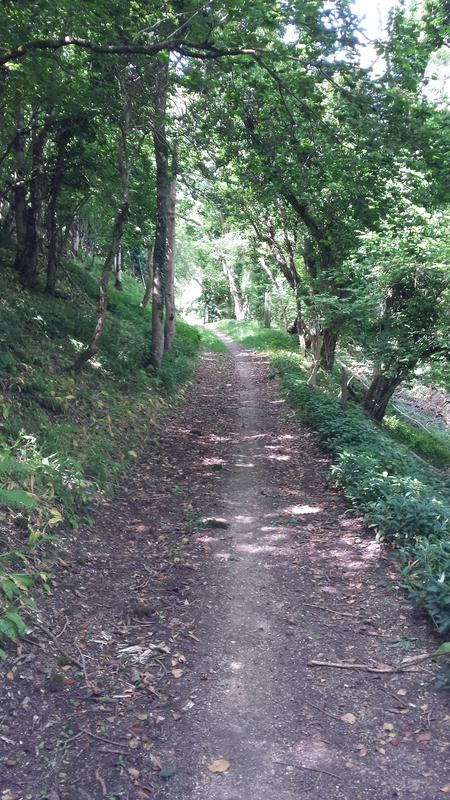 This was a very pleasant way to spend a day walking and talking. 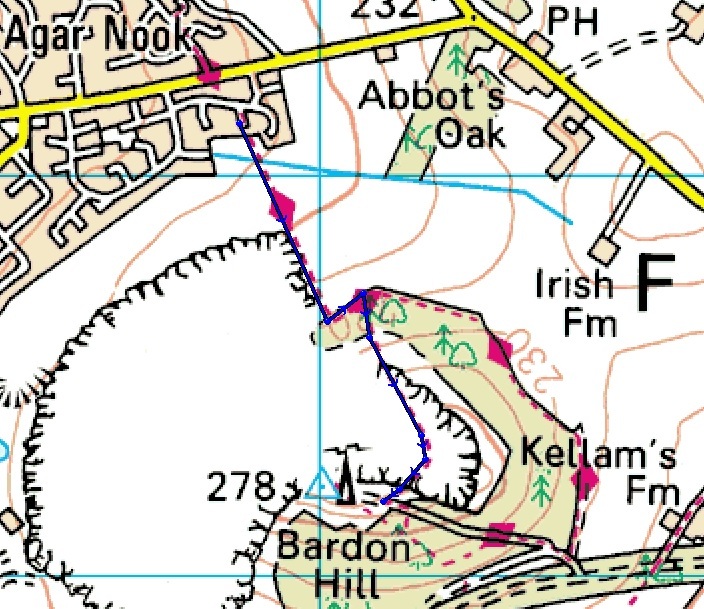 Having spent the weekend at Center Parc Sherwood Forest with my extended family to celebrate my Mothers 80th Birthday it seemed silly not to activate Bardon Hill as it was enroute and a fairly easy 1 pointer. Originally had planned to activate the hill on the way to Sherwood Forest but I enjoyed the comfort of the Premier Inn the evening before too much!! 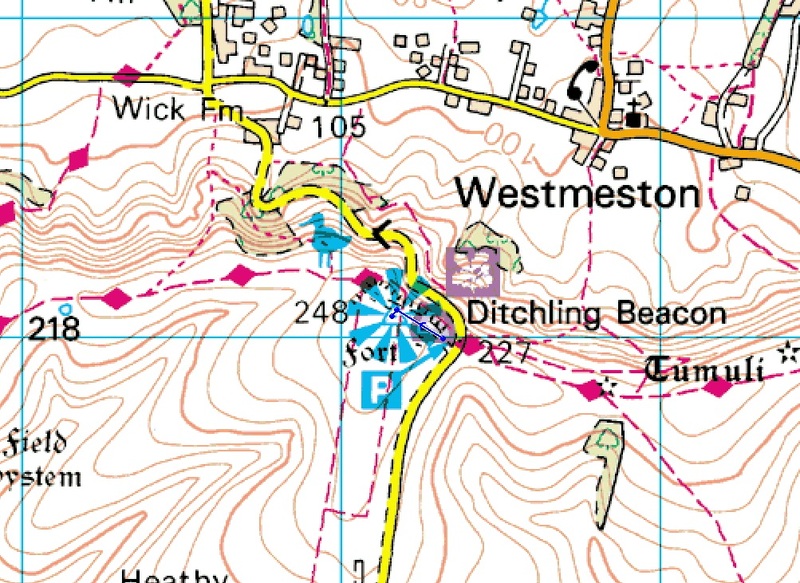 The satnav took me straight to the start point on Dauphine Close where it was easy to park the car and I set off up the footpath towards the woods. Through the gate and turned left for 100 metres before turning uphill at the gate after the large painted boulder. A nice steady pull up hill got me to the top in 25 minutes covering a distance of 0.78 miles and an ascent of 290 feet. 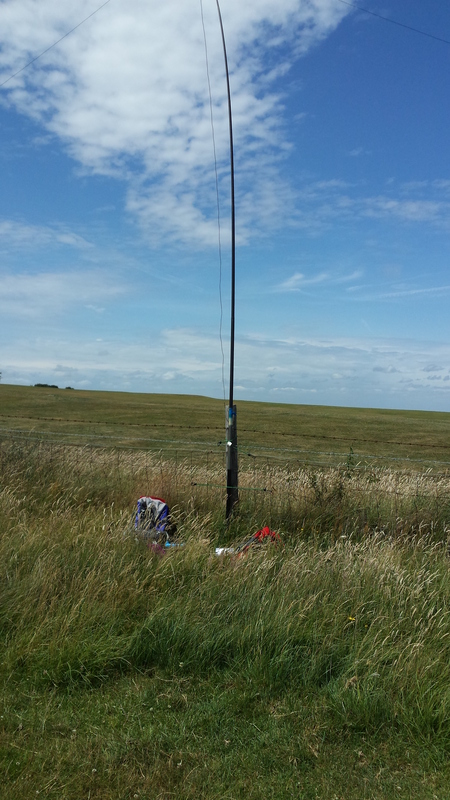 Having found a suitable mast support away from the area occupied by the public I opened up on 40m SSB. This was intended to be a quick activation as my wife was sat patiently in the car, though it was not going to be a smash and grab 4 contact and go operation. 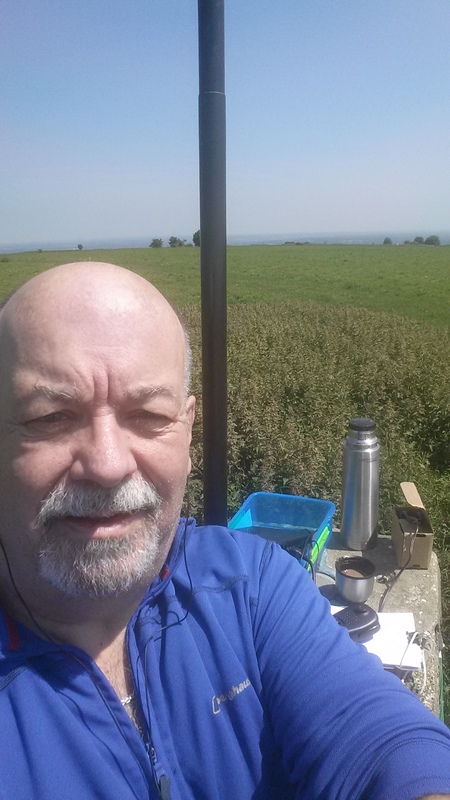 Found a clear frequency around 7.130Mhz and put out a couple of CQ calls before Andy G8MIA responded and advised me that the band was very much up and down with QSB, so nothing much had changed over the weekend! He also spotted me as well which brought in everyone else. Eleven further contacts were completed G3ZRP, M0TTE, M0IML, G0VWP, DL8DXL, M0NTC, G0FEX, G8ADD, PA0SKP, G6TUH & PA0B for drying up. A couple more calls brought no further responses so a quick pack up and off back down the hill to my wife and a 3 hour drive home. 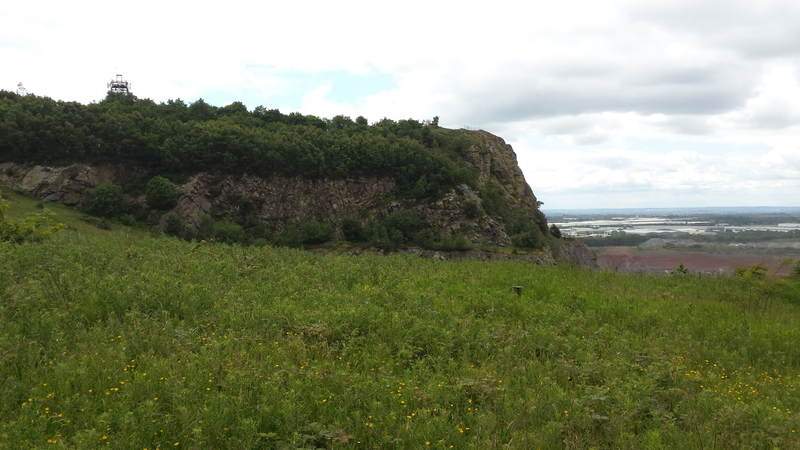 The summit of Bardon Hill taken on the way up – shows the man-made damage caused by quarrying. Having been off work for a week with a chesty cough I was starting to go stir crazy and felt the need to get out in the glorious sunshine. Still not being 100% I needed somewhere to go that was not going to put too much strain on my recovering body. 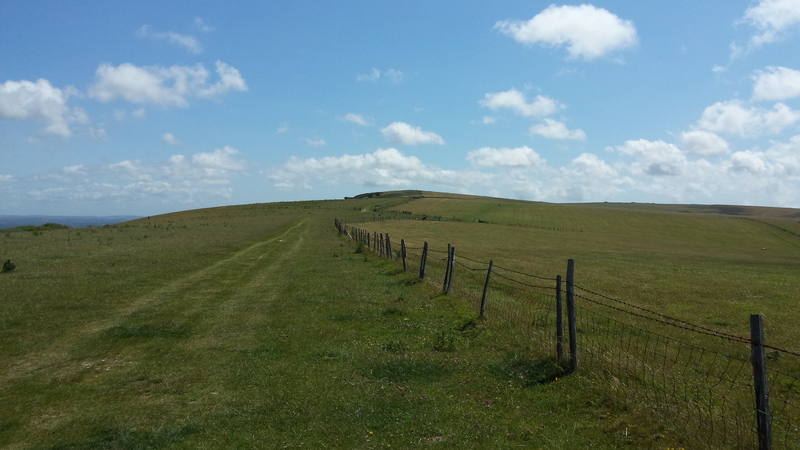 So with battery charged and bag packed I set off for Walbury Hill a drive of just under the hour. On arrival at the car park (SU 370 620) there was only one other car parked up which is always encouraging. 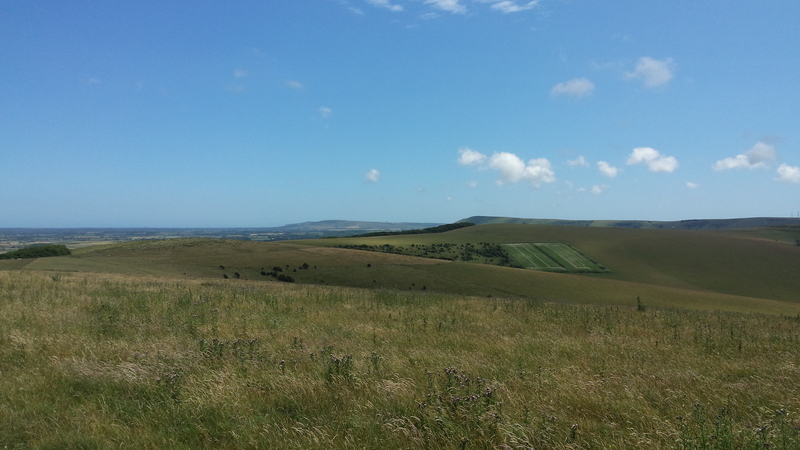 It was a gloriously sunny and warm day and a few moments were taken out to enjoy the beautiful scenery and observe a Red Kite hunting in the thermals created by the upslope of Walbury Hill. 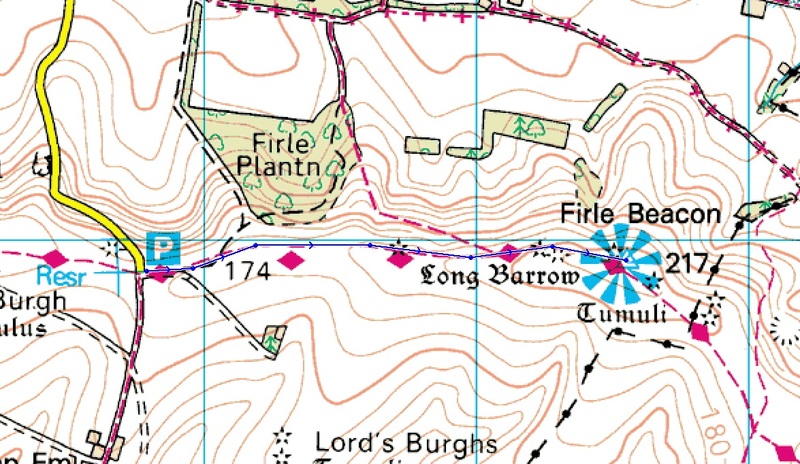 A short walk up the track to the gate into the field on the right hand side and then an easy flat walk to the trig point. 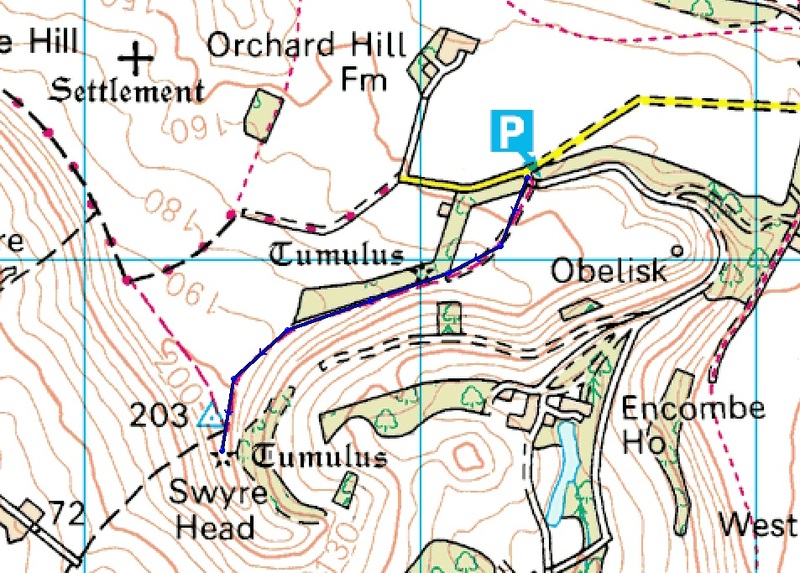 Car to trig in 10 mins at a leisurely pace, distance of 0.358 miles and ascent of 56 feet. Fortunately the field was devoid of sheep, though the fresh evidence of their occupation was all around to be seen and stepped into!! More importantly, it was also devoid of human presence. 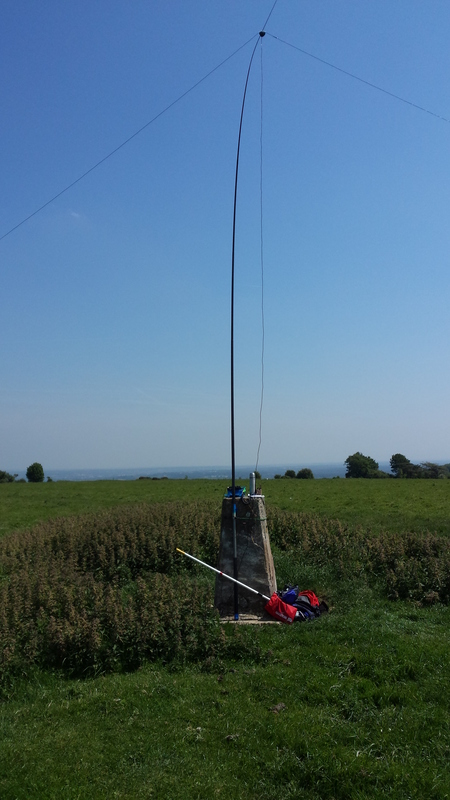 Chose to activate from the trip point and quickly had the mast and radio set up. Tuned around and was greeted with nothing, I knew the band conditions were poor but this was ridiculous. Tried a call and noted low power output as well. Quick check confirmed that, in my haste, I hadn’t connected the aerial to the rig!! Band conditions seemed very poor today. Opened up on 60m SSB and managed 3 QSO’s into the log, thanks to Andy G8MIA for the spot. 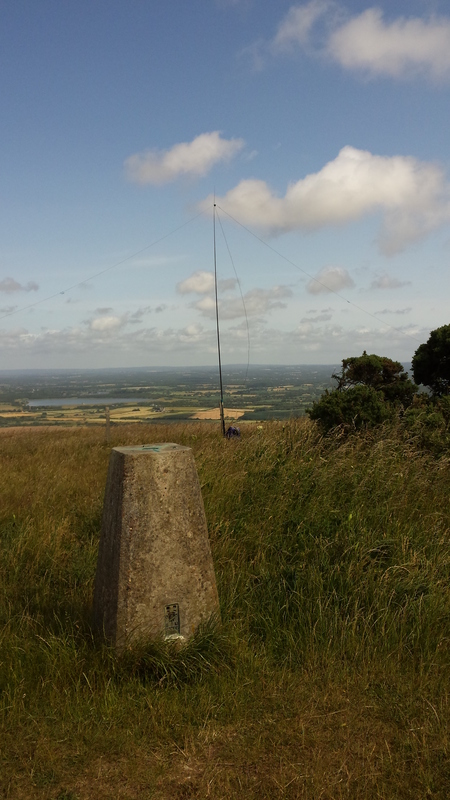 A check of 40m SSB and after several calls nothing at all, quick tune around and the band appeared totally flat. Changed to 40m CW and got a quick spot from KU6J, this resulted in 6 QSO’s in quick succession before the band died again. One more call on 40m SSB resulted in a QSO with a none chaser but that frittered away due to very heavy and deep QSB – 59+10 to silence in seconds! 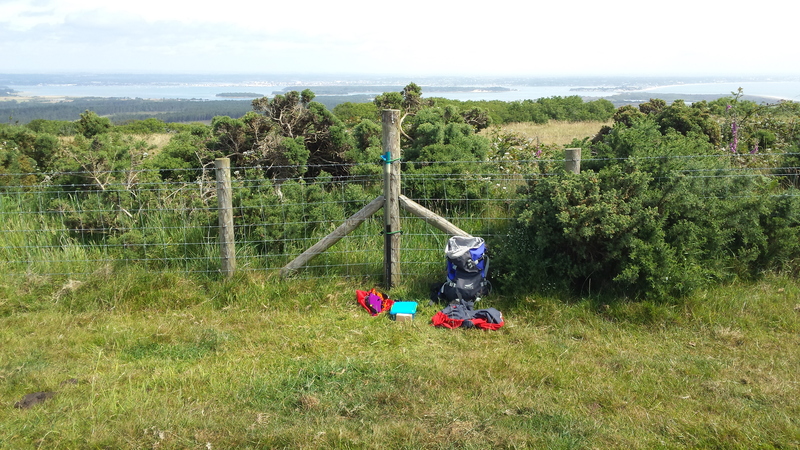 A quick pack-up of the HF gear and a relaxing lunch sat on the troughs by the trig. Several calls on 2 FM but to no avail, so a leisurely stroll back to the car with a quick stop off to look at the Iron Age Hill Fort ramparts just above the car park. (my academic background is an MA in Archaeology).